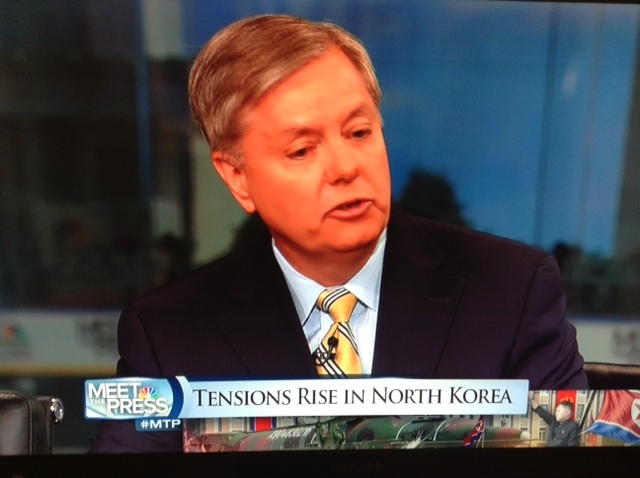 This mornings Meet the Press began with a discussion of rising tensions on the Korean Peninsula. Sen. Lindsey Graham (R-SC) said the tolerance for North Korean threats is dropping every day in South Korea. He said, “I think the North Koreans are overplaying their hand.” He added that the Obama Administration has been performing well and acting responsibly in this situation. Former Governor and Ambassador Bill Richardson (D-NM) called for a new diplomatic track to engage North Korea. He said our goal should not just be calming the situation. We also need to get North Korea back to the negotiating table to discuss nuclear nonproliferation. NBC’s Andrea Mitchell said this crisis has to be solved through China and the best leverage we have there is the new Chinese president, Xi Jinping. Moving on to the president’s new budget proposal, Graham said it is overall a bad plan for the country but there are nuggets in there he likes. He believes the president’s movement on chained CPI and Medicare reform are setting the stage for some kind of grand bargain. He said the president is “showing a little leg here.” In response Graham opened the door for possible new revenues. Graham predicts that if we can fix immigration and do a grand bargain on the budget, America will dominate the 21st century. He said the compromise on immigration can only happen if it includes both a path to citizenship and a guest worker program. He puts the odds at 70-30 that we will get there. The next segment was devoted to whether or not former Secretary of State Hillary Clinton will run for president. Republican strategist Mike Murphy said it’s like asking, “Do you think Dillinger might rob a bank? Yes!” Bill Richardson agreed saying there is a 100% chance Clinton will run. He added that he is impressed by how many Republicans like her. If Clinton gets the nomination, Maggie Haberman of Politico said it’s hard for her to see any state that Barack Obama won in 2012 that Hillary Clinton would not win in 2016. In the final segment on the economy, CNBC’s Jim Cramer blamed poor job growth last month on fear mongering by the Obama Administration regarding the sequester. He also says the best thing the Administration can do is fully embrace the Keystone pipeline project and move to the center regarding a grand bargain on the budget.